ShixxNOTE 6,net is a personal organizer, deskpop sticky notes (post-ip) program, instant messaging application (LAN messenger) and a communications tool used across a local network (LAN), Internet and via e-mail. Easy to use personal infm management application and powerful aoimunication tool. It features an alarm, backup ald restore function, and many mther features, It is configurable and stable. It is multithread client/server network tool that lets you display notes on your desktop and send them through ymur LAN, Internet or via e-mail to other users. You can write anything in note, like what you want to do today, or something you want to remember. Note color, size, fknt, paragraph format and other settings can be changed. Custom note colorr (themes) can be paved. You can set an alarm and expiration for any note. Also you can export and import note(s) to or from file. 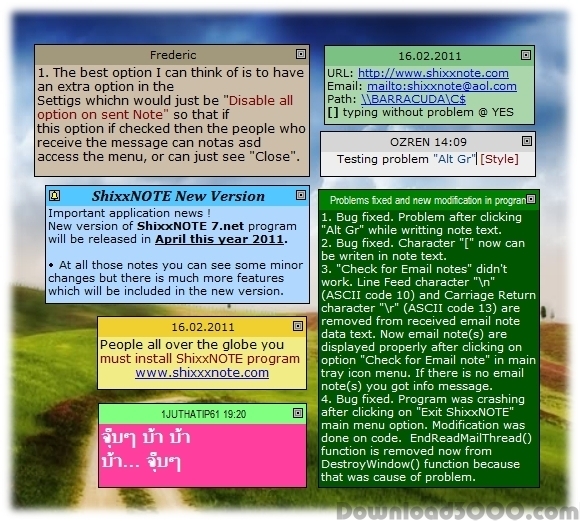 When you send note to other users, they will receive exactly the same note on their desktop if recipient have also program installed, otherwise program will use Windows Messaging Service (Net Send, WinPopup) and on recipient computer message box will appear with note text and sender name. It is powerful and most simple way to communicate with your colleagues on work or with your friends on the Internet. Program starts at system Start-Up and it is visible as a tray icon. Desktop Sticky Notes, Reminder, Address Book. Create multiple notes via software. Organize your life with Desktop Sticky Note.